gluten free – A spoonful of yummy! Delicious, garlicy, creamy pasta. Filled with all the low fodmap alarm bells right? Not anymore! With some quick and simple substitutions you can live out all of your delicious pasta shaped dreams without any of the belly ache. And, might I add, this dish has SO MUCH flavour!! You may never want to eat anything else ever again… just saying… you have been warned. I served this up to my husband and friends last Friday evening and they loved it so I thought I’d share it with you too! Tip the pasta into a boiling pot of salted water. I add some olive oil at this stage because gluten free pasta sometimes needs a bit of help to not get stuck together. Cook for around 15 minutes or until soft but al dente. Drain the pasta and leave to one side. Meanwhile, melt the butter and mix with the garlic infused oil in a large non stick pan over a medium heat. Add the prawns and cook for 1 1/2 minutes on each side until they are warmed through. Remove the prawns and leave to one side. This will add flavour to the butter. Add the wine and stir. Simmer for 2 minutes until wine mostly reduces. Add the cream, stock and parmesan and stir until the parmesan is melted, then leave to simmer for 1 1/2 minutes until it thickens slightly. If it doesn’t thicken enough then I use a bit of cornflour to help it along. Add the prawns, stir, then add the pasta . Toss the pasta in the sauce, it will thicken in about 30 – 45 seconds and start clinging to the pasta. Turn off the heat and sprinkle in the parsley and black pepper, check to see if you want to add a bit of salt. Toss again until the sauce consistency is to your taste. Add a splash of water if it gets too gluggy. There’s nothing like a slab of banana bread, dripping in cream cheese icing to cheer you up after a long day. I remember having banana bread when I was little and it always feeling like a proper treat. So when I saw the bananas that I’d bought in the delusional hope of making lots of healthy smoothies every day and then turning into a yoga health godess, browning rapidly on the side, I knew what to do. Of course, this recipe is low fodmap friendly but I don’t think anyone would know that it wasn’t made with proper flour or that you were on a special diet. The bananas add such a lovely natural sweetness that you can afford to lower the sugar content without this cake feeling ‘healthy’ or deprived. Preheat the oven to 180 C then grease and line a 2lb loaf tin with baking paper. Tip the flour, butter, sugar, cinnamon, vanilla, baking powder and eggs into a large bowl and mix together until fully combined. Fold the mashed banana through the mixture. Pour the mix into the prepared tin and bake for 50 minutes (check it’s ready by piercing the centre of the cake with a skewer or butter knife – if it comes out clean then the loaf is ready). Turn the loaf out onto a wire rack and allow to cool completely. Beat the icing ingredients together until smooth and slightly stiff. Smooth onto the loaf when it’s cooled. I like to top mine with chopped walnuts or blueberries. I’ve always loved a good chunky vegetable broth. It’s so comforting and packed full of goodness . My Baba (Ukrainian grandmother) makes the BEST vegetable and noodle soup! It’s like medicine for the soul. 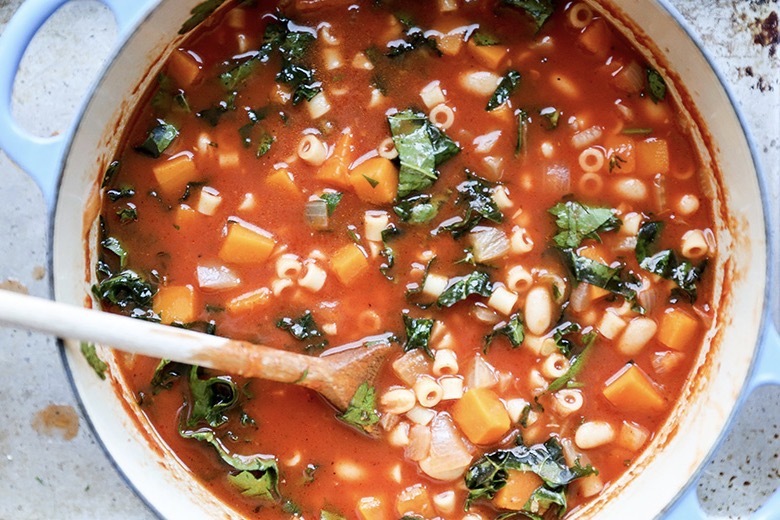 Minestrone soup makes me feel the same way. So much love, attention and honest, simple ingredients go into making it. There are so many different ways of making it and hundreds of different family recipes but this recipe is my way. Dice all of the veg and throw them into a deep casserole dish or saucepan. Tip in all of the other ingredients except for the pasta and the cornflour. Pour over enough stock to cover everything. Simmer until the veg is soft then tip in the pasta. Once the pasta is cooked, mix the cornflour with a splash of water then slowly pour into the soup whilst stirring continuously. Check the seasoning and mix in some salt and pepper if you fancy it! Enjoy! It’s great to take as a packed lunch to reheat at work and will last up to 5 days in the fridge! I LOVE risotto. That creamy, comforting, steaming bowl of yum that fills you up just right. Making a beautiful risotto is so easy but filled with cream, garlic and onion it’s definitely not low fodmap. Well I’ve come up with a recipe that’s both low fodmap and still tastes like that gooey, ricey goodness that we all love! Enjoy! Prepare porcini mushrooms: Place dried porcini mushrooms in a bowl with 1 cup boiling water. Weight down the mushrooms with something so they stay submerged for 30 minutes. After 30 minutes, squeeze mushrooms (saving all liquid) and chop porcini mushrooms coarsely. Heat the stock and mix with the mushroom liquid. Finely chop the spring onion ends. Finely grate the Parmesan. Add the rice and spring onions and turn up the heat – the rice will now begin to lightly fry, so keep stirring it. After 1 minute it will look slightly translucent. Add the wine and keep stirring. 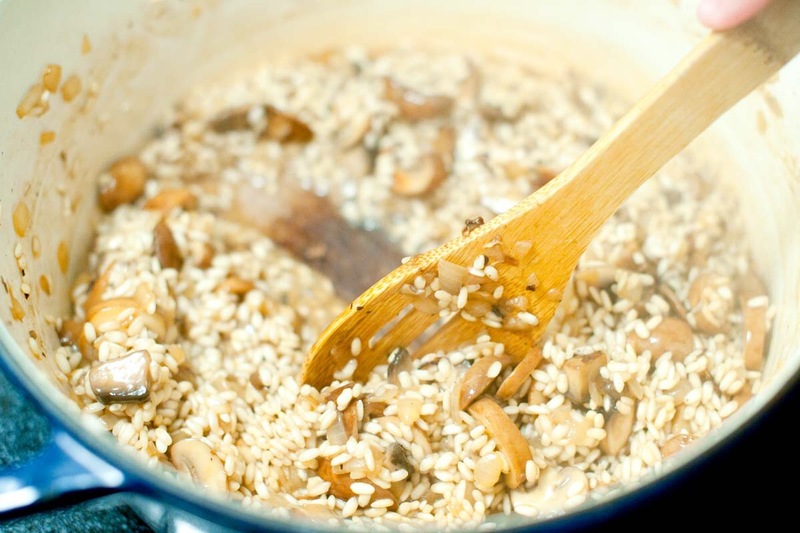 Once the wine has cooked into the rice, add your first ladle of hot stock along with the mushrooms and a good pinch of sea salt. Turn the heat down to a simmer so the rice doesn’t cook too quickly on the outside. Keep adding ladlefuls of stock, stirring, allowing each ladleful to be absorbed before adding the next. This will take around 15 minutes. Carry on adding stock until the rice is soft but with a slight bite. Don’t forget to check the seasoning carefully. If you run out of stock before the rice is cooked, add some boiling water. Remove the pan from the heat, add 1 knob of butter, the parsley and the Parmesan, then stir well. 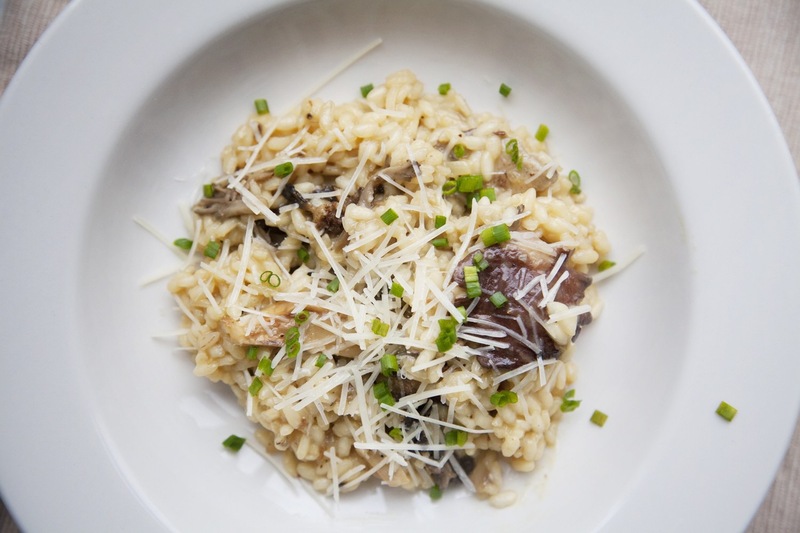 Place a lid on the pan and allow to sit for 2 minutes – this is the most important part of making the perfect risotto, as this is when it becomes creamy and oozy like it should be. Serve. This also makes a great leftover lunch! Lately this pancake has turned into somewhat of a craze in the health world as a super yummy, protein packed meal! They’re stupidly easy to make and taste exactly like normal pancakes (honestly!) with a hint of banana. This year I’ve had to give up having wheat and dairy in my diet and one of the worst parts was the thought of missing out on pancake day. Luckily a lovely friend of ours gave us this recipe and suddenly the world seemed a brighter place! I have tried a lot of substitute recipes in the past for different meals but this one has by far been the most impressive. I like to add a sprinkling of cinnamon and a few drops of vanilla essence to really make these pancakes stand out, but if I’m honest they’re perfection even without these extras. I like to serve these the traditional way, with a sharp squeeze of lemon and a pinch of sugar, but they’d be great with a drizzle of maple syrup and hot, crispy bacon or anything else you may fancy! Use a fork to mash the banana. In a separate bowl, whisk up the eggs then mix the two ingredients together (if you’re pushed for time you can use an electric whisk). If your want to add in any extras, such as cinnamon or vanilla, mix these in too! Next, prepare your pan by pouring in a little oil of your choice and putting it on a low/medium heat. Add your pancake mixture in your desired amount to the pan,then let it set for around 30 seconds (or when the middle starts to bubble) then flip it and fry for another 30(ish) seconds! Repeat until you have no mixture left. Serve with your favourite toppings and don’t be surprised if you decide to make some more for seconds!